A mortally wounded Miss America entrusts a mysterious Russian coin to Damien Dickens, PI, before she dies. After Damien disappears while researching the significance of the coin, Millie tracks her husband's abductor to Florida. When his captor falls to his death from the balcony of a seventh floor apartment, Damien escapes; then he and Millie join forces to unravel the web of intrigue surrounding the Russian coin and its connection to the murder of Miss America. 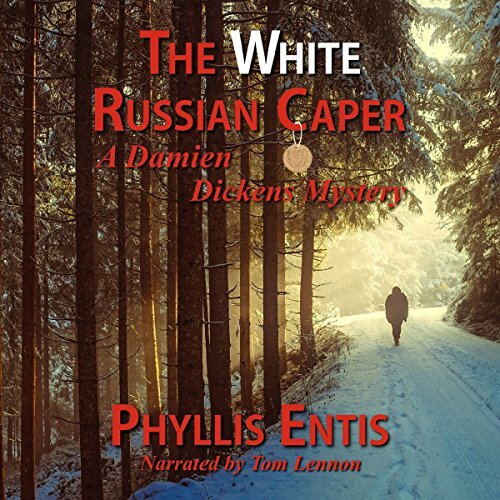 The White Russian Caper is the second book in the Damien Dickens Mysteries series. This is the 2nd book in the series . Damien and Millie have a great adventure in this book. I enjoy mystery books. The author gives the reader great descriptions without going overboard. Great Mystery Starring Damien Dickens and Millie! This is the second book in the series and can probably be read as a standalone, but I would highly recommend that you read The Green Pearl Caper first. Damien gets a call for help from the somewhat foppish Stephane Major, manager of the Boardwalk Hall, home of the Miss America Pageant. The good Mr. Major is overwrought, Miss America is missing! Damien agrees to meet him at the Boardwalk Hotel and Casino where Miss America - aka Miss Cynthia Mills - has her suite. When Damien searches her rooms he discovers her in the bathroom. She has been badly beaten and is on the point of death, but she manages to convey to him that he must safeguard an old coin. She dies before she can provide any more information. The distraught Stephane Major begs Damien for help, Damien accepts, but his investigations lead him in to great danger and he is abducted. His resourceful wife Millie decides that she will find her husband who, having escaped from his captors has had to undertake a gruelling trek from somewhere in the wilds to somewhere civilised. He becomes ill and confused, eventually a police officer, thinking that Damien was drunk, drugged or crazy, approached him to see what his problem was and, as thanks, got his nose broken! Damien is taken to hospital but nobody knows who he is. Meanwhile, Millie is still searching for him, and there follows great drama and excitement. We were introduced to Millie in the first Damien Dickens mystery, "The Green Pearl Caper". Millie worked as Damien's secretary until things went awry, but happily, they were eventually married. I was delighted to discover that in this latest mystery, Millie's character has been greatly expanded, part of this book is written from Millie's point of view, which, in my opinion is an excellent move, adding dimension and interest to the story. This was a thoroughly enjoyable listen, a great mystery, lovely ending and with some wonderful characters, Particularly Millie and the unforgettable Mr. Stephane Major, n’est-ce pas? Narrated by Tom Lennon who, once more does an excellent job. By using just the subtlest changes of tone, rhythm and pitch he makes each character so distinct and recognisable. He is very easy to listen to, his voice never intrudes upon the story but enhances it. The recording quality is excellent. The White Russian Caper is the second in this series I have listened too. Again I was really happy with everything about it. The hero is a the epitome of the classic Hard-Boiled detective (with a soft gooey yolk where his wife is concerned). This is further reinforced by the time period being around 1980. At times it reads and sounds more like 1940, but that doesn't take away at all. You just know it is not today. Those of us old enough to remember hunting for pay phones and there not being a casino in practically every city in the US will relate. I think the narrator contributes a lot to this Sam Spade/Phillip Marlowe feel (I like those guys so that's a compliment). He is not quiet as hard nosed as Marlowe - sounds more like Raymond Burr as Perry Mason which is very fitting for the way the author has written the dialogue. Burr was never high energy, but always enjoyable. This type delivery wouldn't work for Jason Borne, but is perfect here. The laid back style is very credible for the voice of Damien. In this book, Millie, the wife, graduates from her minor co-star role in number #1 to equal billing with the star. Her interface with all the characters in Miami is especially enjoyable. Yes, there is some stereo typing of the Miami residents of the period but it is not offensive at all. Think Molly Goldberg. There is a complex plot to figure out for the mystery fan as well as a great deal of action, without going overboard with violence, to keep it from being dull. It is a feel good mystery and there are a few places where you will probably laugh and none where you will cry. Will be looking for the next in this series. Note; At the end of the recording there is a short story told by a dog about his finding new masters. It is based on something in the authors life. It neither adds or detracts from the book and I am ignoring it in this review. Not my cup of tea, but not relevant to my enjoyment of the real story. This is a little step down from number 1 I think. Still a good book, but has at least one annoying flaw for me. Seems like every fictional PI says at least once in every book that they don't believe in coincidences. For some reason the ending of this book is wrapped around the biggest coincidence of all. Totally unbelievable. I don't want to give a spoiler, but really? Where was Millie? Really took away from my overall opinion of the story. While set in 1980 the narrator has more of a 1960 sound, but I liked it a lot. He made Damien a nice guy I would want to find out more about in the future. He sounds just like I imagine Damien. Maybe not the most sophisticated PI you have ever met, but he kind of plods along and gets to where he needs to be. A fun old fashioned gumshoe mystery. The book is filled with interesting characters and snappy dialogue. Tom Lennon does a good job; his voice helps establish the 1980 vibe. This is the second book in the series. It is not necessary to listen to the first book, but it helps set the scene. I was provided this audiobook at no charge by the author, publisher and/or narrator for an unbiased review via Audiobook Boom. I've listened to the first book and was very exited to start the second. It was a delightful experience once again and it was like hooking up with old friends! Baby, I'm home! The Damien Dickens mysteries is an old-school detective series, where the police had no clue and had to investigate with a lot lesser tools than today. In The White Russian Caper, we're in 1980 and also facing the birth of a computerized world. Though, the police had computers in some divisions, the systems couldn't communicate together. Very fun! Miss America gets beaten up and wounded, but Damien Dickens finds her in time to get her to the hospital. She tells Damien to hold a rare coin for her. The coin has connection to Russia and other people wants it. While Damien tries to investigate the coin further, he disappears. Damien's wife Millie has a huge role in this book, as she goes after the clues she gets, to find Damien. Millie is a very strong and calm character and her personality really develops in this story. Even she's worried about Damien, she's not afraid to take the next step. I loved Millie in this second book and she is my favorite character now. I also had many great laughs on this journey. It was impossible for me to guess what would happen next and Phyllis Entis can really write a great mystery. I'm sure to pick up the third book in the series, when published! Narrator Tom Lennon did a very good narration - again. His female voices is a little funny sometimes, but I get it. It's hard, when you have a deep male voice. He's very much involved in the story and performes with a good sense of humor. You won't be bored! Phyllis Entis has done it again. This is a clean,, attention grabbing story featuring that loveable detective, Damien Dickens. What does an old coin, Miss America, and a trip to Florida all have in common? You'll have to listen to the story to find out. This kept me so intrigued. I thought I was over and all settled when there was so much more to solve. Wonderfully written never leaving out any detail. Loved the storyline .... kept me involved right from the start. had a little trouble with the reader, but enjoyed more as the book progressed. good mystery and characters and look forward to reading more by this author! This is an enjoyable, old fashioned caper set in a time before mobile phones. The central characters are well formed, leaving the memorable impression of a fond couple willing to face hardship and danger for each other and who are invested, not only with generosity towards others but also above average detective skills. When her husband goes missing the day before their belated honeymoon, Millie goes into action. And there is action aplenty - and food eaten and enjoyed. It feels very human, plausible even. The narrator has a good voice for this style and era of writing, giving a slightly gravelled, laconic presentation. The reading is steady and clear although, just occasionally, his identification of the speaker seems confused in conversation. This does not, however, distract from the overall story. This is a murder mystery to savour at least as much for the protagonists as the story itself. There is an additional bonus short story seen from a dog's perspective at the end of the book, totally unrelated to the main mystery. My thanks to the rights holder of The White Russian Caper, from whom I received a complimentary review copy, via Audiobook Boom.